We see Dad’s Army on our screens so frequently that it is easy to forget just how old it is, and how much has happened since it was first screened. In 1970, when the episode Absent Friends was made the events that would shortly ignite 30 years of civil unrest and violence in Northern Ireland (and beyond) were only just beginning. So there was little controversy in including as a character a fugitive from the IRA. Very quickly things would change, however, and after its first broadcast the episode was not repeated again for 42 years so for many people this is a less familiar episode. 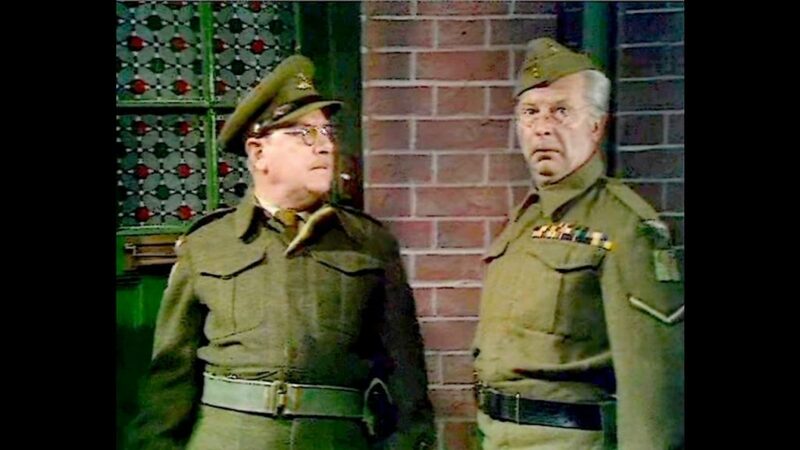 The clip I have chosen has nothing to do with the controversial elements in the episode but centre on a wonderful comedy of errors caused by a misunderstanding between Mainwaring and Jones. The ever-tricky Elizabeth Mainwaring has been pressuring her husband to take advantage of his access to Mr Jones, the town butcher, to acquire some oxtail. It is not the request that bothers Jones but the possibility that Mrs Mainwaring’s craving might be a result of a condition more surprising than simple greed. This entry was posted in blog on July 27, 2018 by wolAdmin.